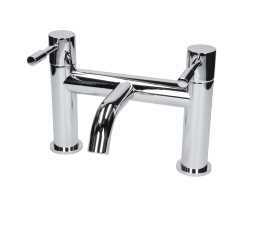 Make great savings with our Architeckt Boden bathroom taps. Easy to use and on trend, relax with the Architeckt Boden Mixer Tap Bath Set at the end of a busy day. Boden’s unique quarter-turn ceramic disc technology ensures that your bath and basin fill quickly and smoothly, with the slightest touch. With no drips or rubbing, this set is guaranteed to last. It’s simple mixer tap function means that you can easily get your water flowing so that it is not too hot, or too cold, but exactly the right temperature. Built to last, these stylish bathroom tap sets are made out of solid brass. With a stunning, streamlined chrome finish, and rust kept away, this set is sure to impress. Compatible with all plumbing systems, every product in this popular Boden range comes with a five-year manufacturer’s guarantee.